Often, we think patrons of Christian art is something that happened mostly in medieval times or in the Renaissance — but not something that really happens in our day of age. 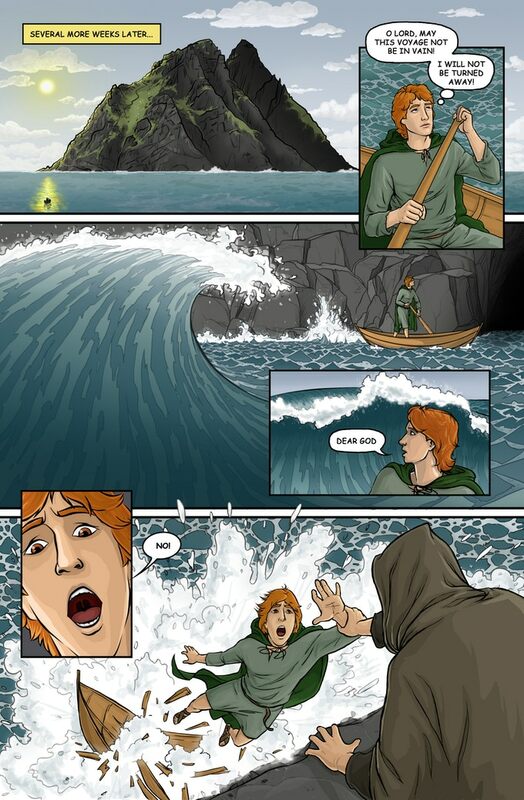 Sample Comic Page of The Last Monks of Skellig Michael, by Michael LaVoy, c. 2017. Copyright to Michael LaVoy. Panel is used from his Kickstarter page to promote his project. An exciting new comic book inspired by the Star Wars filming location Skellig Michael, and the island’s ancient real-life history. In the midst of the 9th century a small remote monastic community lives independently from the world atop a rocky island off the coast of Ireland. Life on the island is extremely difficult and few men are admitted to join. Most are turned away upon arrival. Finnian, a fiery and adventurous young eighteen year old boy from the mainland, rebelliously leaves a monastic school with the intention of joining the monks on the the distant isle. What happens next is most unexpected and through a series of mysterious events the young boy is caught up into an adventure he never thought possible. THE LAST MONKS OF SKELLIG MICHAEL is an ongoing comic series that explores the radical life and exciting adventures of the ancient monastic community on the famous island. It is aimed at both teen and adult audiences. In creating this comic book a great emphasis was put on crafting an engaging story while matching it with equally stunning visuals. For those of you who are wondering what Skellig Michael looks like, here is the Star Wars scene that features the location! Rey meets Luke Skywalker for the first time in Star Wars: The Force Awakens. Filming location is Skellig Michael, Ireland. The project is a collaboration between several people. Phillip Kosloski, a writer that writes for the Catholic news site, Aleteia, has written the story. Michael LaVoy, a freelance artist with a strong Catholic background, is the artist that is featured here and will do the majority of the drawing in the comic. Jim Fern, a comic artist who has worked with Marvel in the comic book industry, has agreed to do another cover and work as an active adviser to the project to make sure the quality is top-notch. John Webber, a former animator at Disney and now currently an Associate Chair of the animation department at the Savannah College of Art and Design, is also serving as an adviser and helping them develop their story. Right now, they are looking for patrons so they can afford to devote more time and energy in finishing this up this product… plus, you know, feed their families while they’re absorbed in this creative pursuit! They are on Kickstarter here: The Last Monks of Skellig Michael Kickstarter campaign. As is typical in Kickstarter campaigns, patrons get certain prizes and other benefits, depending on how much money they put to support the project! Honestly, I am pretty excited about this project. I love classic religious art deeply, which is one of the reasons why I made this website in the first place. But many of these great classic artists were only able to make such beautiful religious art in the first place was because they were patronized by a number of people. Otherwise, they would not be able to pursue such art in the first place. Of course, back in in the Middle Ages and the Renaissance, the Catholic religion surrounded everyone so that often art was made about religion! But nowadays? Religious modern art is not as easy to come by. In fact, it can be quite difficult to find high-quality, modern, religious art! So, to be able to patronize a new, upcoming art? That means that I can be as cool as the Medici family! And this project? It combines storytelling — something that, as a writer, I absolutely love — while using the Catholic faith as a backdrop of adventure and wonder. Which is just thrilling. Honestly, our Catholic faith is so rich in mysticism and wonder with the miracles that both Jesus and other saints have wrought, combined with our deep, ancient rituals as a Church, that it makes me wonder why many writers haven’t written about Catholicism with the same sort of eagerness that fantasy writers write about their make-believe worlds. Especially when Catholicism is much richer than your typical fairyland! So to see these creative people with talent pursuing this art of storytelling and artistry using the Catholic faith as their motive and driving force makes me super happy. Religious art is not dead! Anyway, if you are intrigued, you can support this project! Right now, they need some more people to back their project in order for them to turn this dream into a reality. Still! I am hopeful! It would be so fantastic to see this project go from the rough stages to the polished final draft. Thank You for giving us all the capacity to understand and appreciate art. Thank You for giving artists creativity to pursue art. Help direct artists to create beautiful art for Your glory.